Winter Safety: Is Your Deck Ready to Handle a Blizzard? Extreme snow can blanket the deck and fencing features of your home, find out how to keep them safe. Maryland and many other regions in the country are being faced with a potentially historic snowfall, one that could cause damage to your fence or deck. Maryland is in a declared “State of Emergency” in preparation for the major winter storm, being classified as a blizzard – meaning winds could surge upwards of 35 mph. Do you know how to care for your deck when it starts piling on? Let’s talk about winter safety. Do You Need to Shovel? In most cases, there is actually not an incessant need to shovel your deck as a result of heavy snowfall. 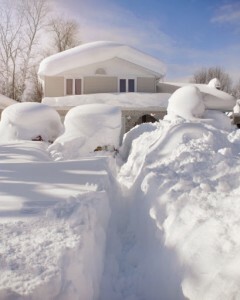 Building codes actually require decks to support more snow than some roofs! If your deck was built properly, there is a very slim chance that it would be damaged enough to collapse due to heavy snow. If the snow manages to surpass your rails in height, then you should take action and begin shoveling to eliminate some of the weight. If you suspect that your deck was not built properly, do your best to remove or distribute snow evenly as it accumulates. Otherwise, you are probably in good shape and can stay inside where it’s warm. Taking care of your walkways is a key component to winter safety. If you plan to be using the deck as a means to get through to your yard or other outdoor space, you should make a clear and safe path for a walkway, and clear stairs and railings of ice if you can. This is also a great idea if you have a dog or other pet that is still going to need to use the outdoors for the bathroom, regardless of the weather. Try to use a plastic shovel, as shovels with sharp edges may cause damage to your wood when used aggressively to tackle snow and ice.